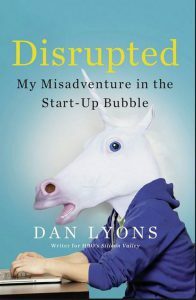 In Disrupted, Dan Lyons tells the story of his time working as a writer (mostly blogs) for the tech startup company HubSpot. Prior to working at HubSpot, Lyons had a number of writing gigs and most of them were technology related. His previous work included writing for Newsweek, New York Times Magazine, GQ, Vanity Fair, Wired, and writing the Secret Diary of Steve Jobs blog. When his position at Newsweek was eliminated, he found himself looking for work at the age of 50, while married with two kids to take care of (his wife had medical issues and was not working at the time). He started the search for new employment and eventually landed at HubSpot, a company that provides software for “inbound marketing.” Disrupted tells the story of Lyons searching for and then subsequently obtaining new employment (and the challenges that go with that) as an “older” adult (and with much younger colleagues), but also his general experience working within the unique tech environment. While not geographically Silicon Valley (HubSpot is located in Cambridge, Massachusetts) Lyons provides an apt description of an insider’s view from within a tech startup. If you are interested in an insider’s view of tech startups, Disrupted is an easy and most entertaining read. If you liked HBO’s Silicon Valley, you would also like this book. And for the record, if you want to foster empathetic relationships, begin with your day to day interactions with real life human beings. Start with Hi. You don’t need software for that.